Watch a few videos on youtube and it is highly likely that you will see an Ad that would show you an individual who builds a website within minutes and brags about how diverse the design can be and those who do not know any better get hitched and take the first step into web limbo. Eventually they will realise that the site that they built in minutes was not drawing the crowd it was intended to and the site strangely does not show up on relevant search strings. As if that is not enough, someone might whisper SEO into their ears and they spend another thick wad of cash on SEO and nothing happens. The attraction of building your own website in minutes for a cheap price has enabled these companies to fill their coffers to the brim only because nobody is the wiser when it comes to building a website. Just ask yourself, if these website builders could do for your business what they claim they can do, why aren’t their own sites built on their own software? Why do they use semantic mark-up and codes that is search engine optimized yet not offer this to the consumer? They do not use their own platforms to build their own sites, because they are aware of the fact that it simply does not work as well as real websites do. Here are some of the main reasons as to why you should never use website builders for your business (Though it is okay to use these builders for personal agendas, just not for business). Creating a website that is functional and effective involves more than just slapping on a few pre-set elements on a page, and garnishing it with your contact details and think that it is done. 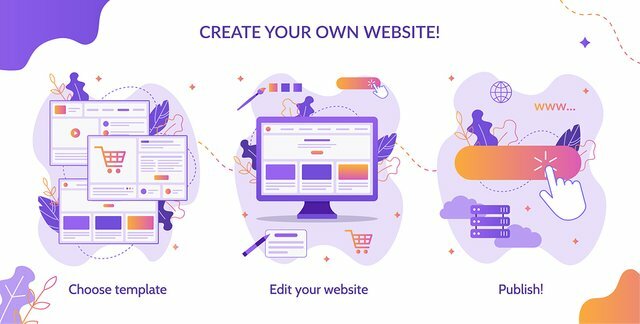 Websites for businesses are intended to create a unique experience for those who visit the site and as such they need to be built with the expectations and the satisfaction of the user in mind. In order to achieve a perfect user interface that is functional, friendly and coupled with an adequate SEO (search engine optimisation) construct on top of a well thought of professional design, the help of a specialist or at least someone who knows how the internet works is invaluable. Some website builders are also created on Flash platforms and the sad thing is that search engines such as Yahoo, Google and Bing are not ‘Flash Enabled’ meaning that search engines will not be able to read and profile your site as easily due to the fact they would not understand what your site is all about. Bad SEO would not improve your sites search results and appearing anywhere else other than the first page is as good as not appearing at all, as you probably already know because how many times have you looked on the second page after you search for something on Google, if it does not appear on the first page, it is more likely that you would change your search string instead of looking at the subsequent pages. This article was prepared with advice from Online Invent, a company with over 10 years experience in website design and web development in Melbourne, Australia.